... what's the theme? ... who are the speakers? This year's presenters included Sasha and Ann Shulgin: psychedelic pioneers and co-authors of PIHKAL and TIHKAL; Jonathan Ott: natural products chemist and entheobotanist as well as author of a variety of books on psychedelic pharmacology; Terence McKenna: lecturer and author whose works focus on the importance of the role of natural hallucinogens in the future of human evolution; Christian Raetsch: Germany's leading expert on the shamanic arts and author of a number of books on psychoactive plants and their historical uses in Europe; Michael Bock: chemist, lecturer, and authority on Australian psychedelic flora and fauna; Rob Montgomery: founder of the Botanical Preservation Corps; Giorgio Samorini: Italy's leading expert on entheobotany, the African Bwiti and sacramental Iboga; Paul Stamets: mycologist and founder of Fungi Perfecti mushroom company; and Manuel Torres: art historian and expert on the ethnography of visionary snuffs. It is in the spirit of the wonderful talks given in those mystical seminars that Palenque Norte is being formed. Our mission is not to re-create the Palenque experience but instead to build upon it with a Burning Man twist. 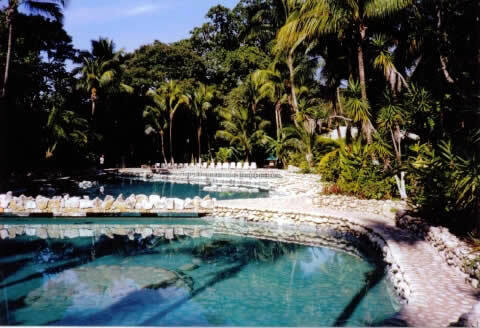 We plan to provide a lecture space designed to reproduce the vibe found "around the end of the pool" at the Hotel Chan Kah Ruinas near Palenque, Mexico. We plan to continue to attract world-class speakers on a wide range of topics (not exclusively entheogens). Since most of the magic in Palenque took place around the end of the pool after the lectures, we intend to encourage that same kind of ad hoc community formation after and between the more formal conversations.